The Mall, a quadruple row of American elms, is Central Park's most important horticultural feature, and one of the largest and last remaining stands of American Elm trees in North America. The elms form a cathedral-like canopy above the Park's widest pedestrian pathway. and are one of the Parks most photographed features. The quarter-mile pedestrian path is the only intentional straight line inside the Park's walls. Taking care of these trees is a full-time job for the Central Park Conservancy's tree crew. Each of the Park's thousands of trees are entered into a database, so they can be monitored by the Conservancy. The trees of Central Park have an important impact on the urban environment. They improve the quality of our air and water; reduce storm water runoff, flooding and erosion; and lower the air temperature in the summer. This is why Central Park is called the lungs of New York City. The southern end of the Mall is known as Literary Walk. The statue of Christopher Columbus is the odd man out, since 4 of the 5 tributes here depict prominent writers. Nearby are Scottish poet Robert Burns and his compatriot, Scottish novelist Sir Walter Scott. A little farther north is Fitz-Greene Halleck, the first statue of an American to be placed in the Park. Ten years after his death, he was still so beloved that over 30,000 adoring fans came to the unveiling of his statue by President Rutherford B. Hayes and his entire cabinet. Today hardly anyone knows his poetry or his name, but everyone remembers their visit to the Mall. If you look down, you'll see engraved granite paving stones lining the southern end of Literary Walk in order to commemorate each endowed tree in the Park. 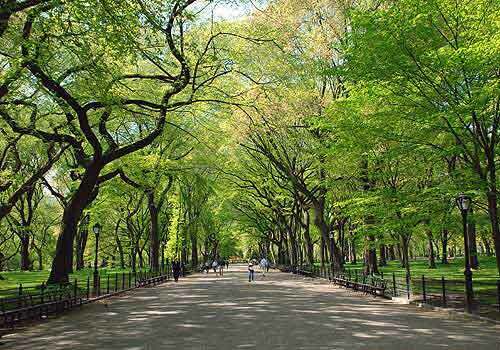 To support Central Park Conservancy's efforts to care for the Park's trees, donate to the Tree Trust to endow the care of an existing tree or to fund the planting of a new tree.